For Bob Boyd, a member of “K” 65/66 Troop, my troop mate, a walk down nostalgia lane! We all remember that we had boards to shine our Sam Brownes on while living in barracks at “Depot.” Those boards, along with the hangars and strips of wood used to hang those horrible white starched PT shorts on, were left for the next troops who would occupy the barracks after we departed for the real world beyond the “Depot” grounds. Connecting the dots here, Staff Sergeant (Ret’d) Forrest (Bush) Halpenny, Reg # 25153, was a member of “K” Troop 66/67, and was a recipient of Supt. (Ret’d), Reg. # 24397, Bob Boyd’s passed down Sam Browne Board. Bush Halpenny and I worked together at Coquitlam Detachment and we always acknowledged we were both members of a “K” Troop, although a year apart. His wife, Gladys, was a member of Troop # 8 75/76, which was the first all female troop I instructed Foot Drill in during my time at “Depot” as an instructor. Bush and Gladys are now retired in Kelowna and doing some clearing out of the old RCMP kit. 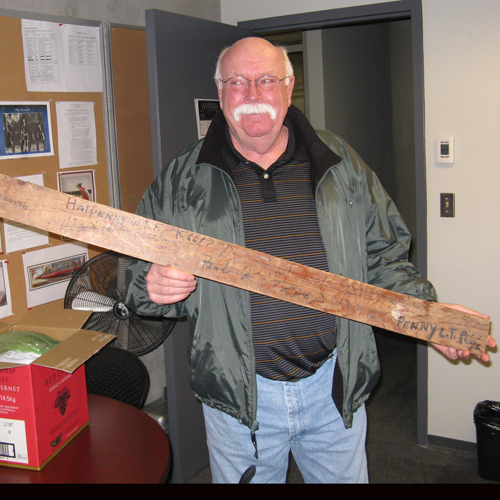 I got the call from Bush, would I like the Sam Browne Board, I jumped at it, thinking it would be great to send it back to my troop mate, but on second thought, he already sent me some of his old kit he was clearing out, that is going to be used in Surrey Detachment’s display cases. So I think a picture to Bob Boyd will have to suffice. The Sam Browne Board will now be designated to the the display cases as a throwback in time….apparently the shining of boots and Sam Brownes has been removed from the barracks and what many of us old dogs know as the Post Garage has been set aside as the land of shoe polish! 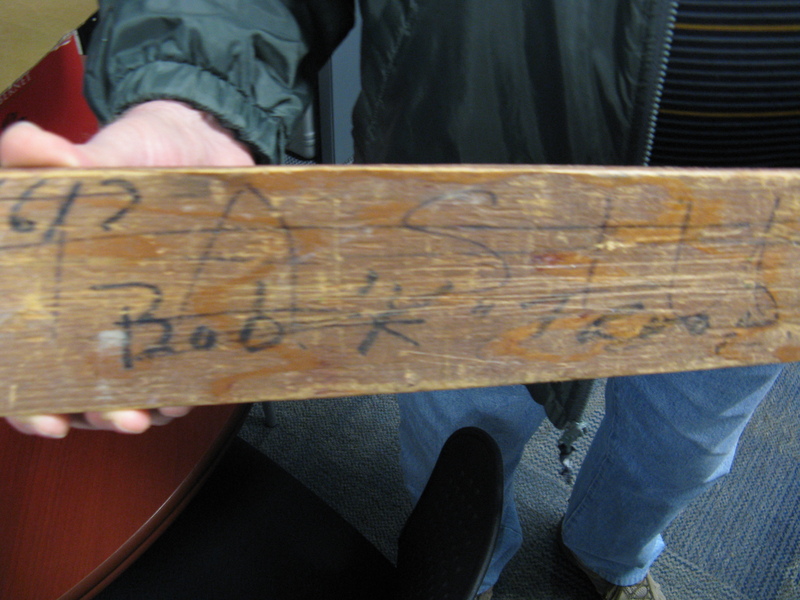 Names on the back of the Sam Browne Board: K.S. Taylor, Maxwell, MacLean – Troop #s unknown. Bob “K”, Penny 65/66 and Halpenny K 66/67.